Alt-text: Our retina display features hundreds of pixels per inch in the central fovea region. Admittedly, I was kinda expecting something different from this for comic 2k, but it's still a good one. As an opticker with a strong hobby-interest in eyeball-related medicine, the alt-text did it for me. Excellent joke + sarcastic dig. Maybe, but we'll probably have a clock count overflow problem ten strips before that one. depends: was the first comic number 0 or number 1 ? Antikythera mechanism: "there's an app for that" but a mechanical version would be cool. Gasoline? couldn't it just eat a bit of the users hand? , a small bite will grow back after all. J%r wrote: Would that front pop-out grip double as joystick? How else are you going to move the mouse cursor? Is it something like "Pokemon Go", then? Can you find other mouse cursors elsewhere in the world if you have to move your phone more than a few inches? KittenKaboodle wrote: Antikythera mechanism: "there's an app for that" but a mechanical version would be cool. Or is that the 2000+ with nail scissors? It truly has been a generation since Something 2000 equals Hi-Tech, if anything any new product with 2000 in its title will be banking on a retro nostalgic vibe to sell it. pkcommando wrote: I have to admit, I would enjoy the coin purse squeeze feature. same. Has that been done? I like the idea of a big, squishy, water proof case. I don't know ... it looks a bit like a sideways* ... er ... violin plot. * No, I'm not going there. 1. Dry erase sharpie. Who knew? The phone's absorbance also makes it perfect for safe ink disposal. 2 . Finally, a Swiss Army ___ still relevant to its namesake. 3. AMOLCD is totally real and for sale, see attached. 4. If hollow-ground describes a way of grinding knives, then the long sides must be sharp, which plays interestingly with the squeeze feature. 5. Is the larger area of sponsored pixels on top of the grip, or mercifully obscured under it? Are the sponsored pixels the sole exceptions to the 7-segment-display used elsewhere? 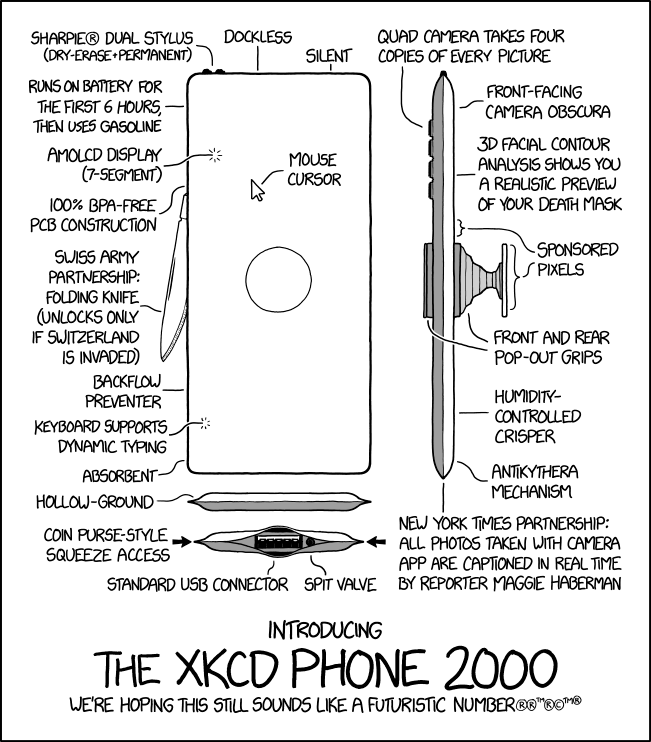 The 2000 indicates that personnel who assemble the phones were not born before that year. Doesn't seem like long since we had the previous one of these. By using a track ball. BTDT. cephalopod9 wrote: I like the idea of a big, squishy, water proof case. You might use a package sealing device. Maybe you already have one, too. I mean, there's sandwich bags, and bags actually designed to protect a small electronic device with water proof headphones connected. I was thinking something more like one of those key-chain floats, or a beer cozy, all squishy and buoyant. Too much beer, and I'm all cozy, squishy and maybe buoyant too. Real estate is more Alibaba's specialty, and even then only if you search vaguely and don't read the result descriptions all the way. Originally found searching for 'land in Arizona'.